After spending some time showing you how to use the HeatnBond EZ Printer Lite for applique work, it’s time to talk about HeatnBond Quilters Edge and SpraynBond Basting Adhesive. These two products make it easy to apply embellishments and practical closures to your sewing projects. They should also be part of your applique toolbox as they allow you to baste your projects making them much easier to sew or quilt. Why is HeatnBond Quilter’s Edge wonderful? It’s only 3/16” wide and so wonderful as a narrow strip fusible product for bias tape and piecing without puckering and fraying fabric. Great to fuse Velcro in place and then sew the Velcro down (avoids the difficult pinning). Great for fusing zippers in place prior to sewing them down, works like hand basting. Great for fusing trims like rick rack and other trims in place prior to sewing. Great for fusing quilt binding in place prior to sewing. It can be used as a pin alternative. HeatnBond Quilter’s Edge applied to the wrong side of Velcro ready to iron and baste to a project, paper backing has not been removed yet. HeatnBond Quilter’s Edge applied to the wrong side of Velcro. HeatnBond Quilter’s Edge with paper removed. You can see the sheen of the adhesive ready to be ironed to a project. Note: You’ll still need to sew the Velcro to the project, the HeatnBond Quilter’s Edge is a method of basting only. HeatnBond Quilter’s Edge with paper removed. 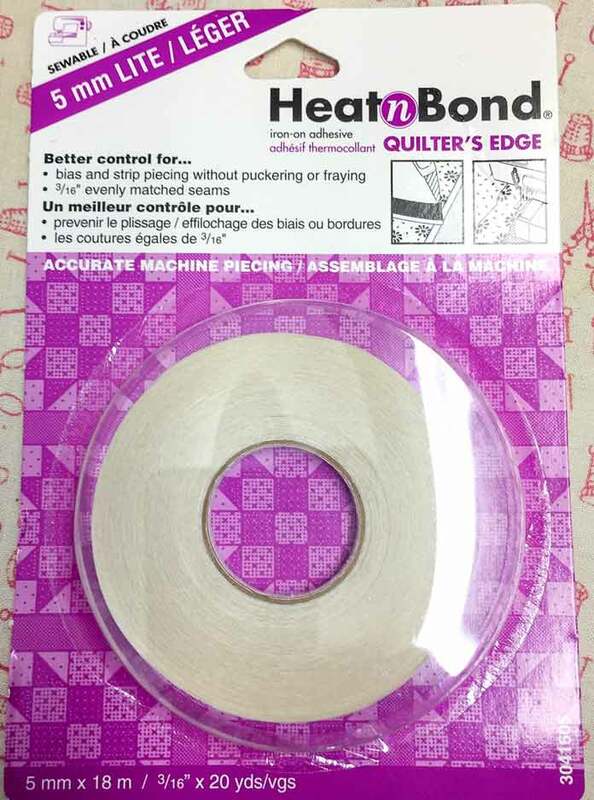 Add HeatnBond Quilter’s Edge to the wrong side of rick rack and iron fuse it to your project. 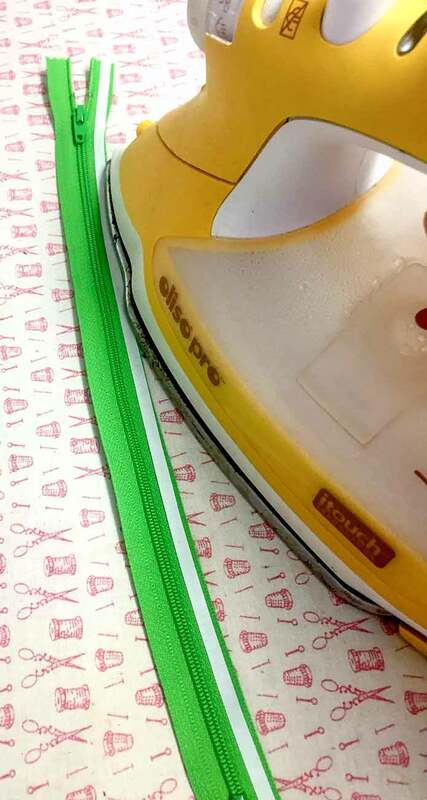 Add HeatnBond Quilter’s Edge to the right side of your zipper to iron baste it to your project. 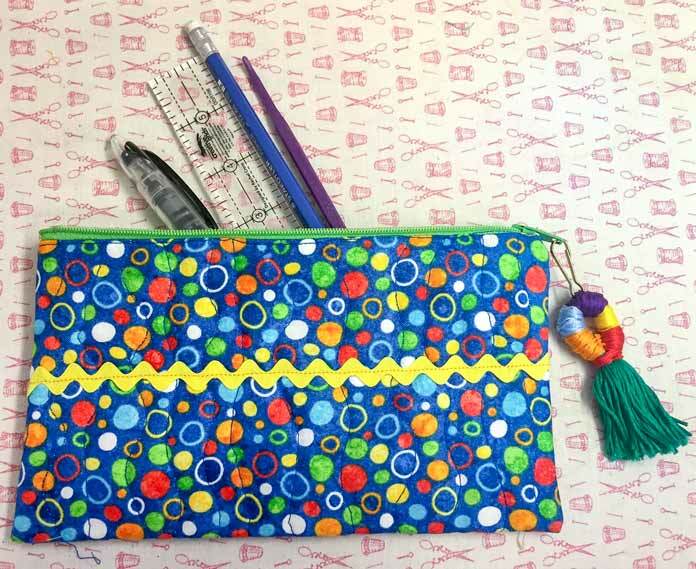 Pencil case made with HeatnBond Quilter’s Edge to baste the zipper and the rick rack. 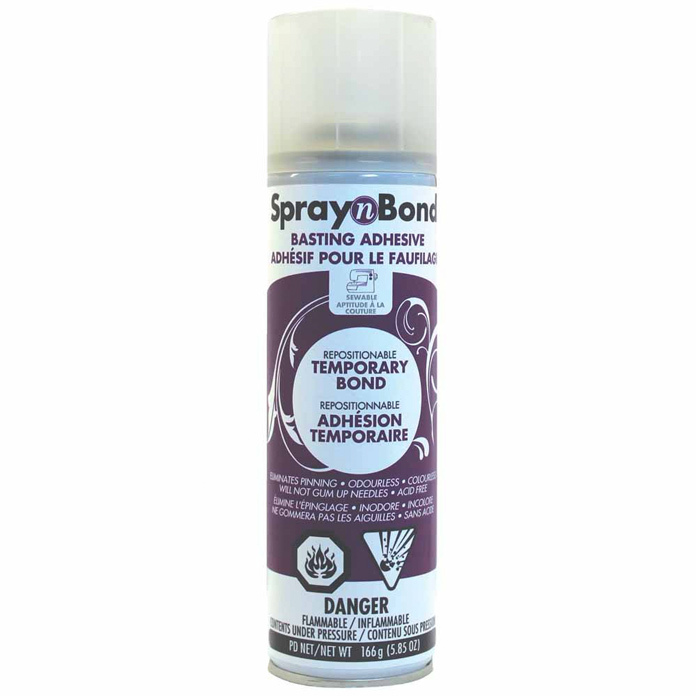 Why is SpraynBond Basting Adhesive wonderful? It holds the layers of a quilt sandwich together so you can quilt without puckers or gathers. It eliminates the need for quilters basting safety pins. It can be used as a re-positioning tool in lieu of basting as it is a temporary spray adhesive for appliques and embroideries. It will not gum up needles. It’s great to hold stabilizers in place while embroidering. Doesn’t add stiffness to the fabric. It will wash out after use. 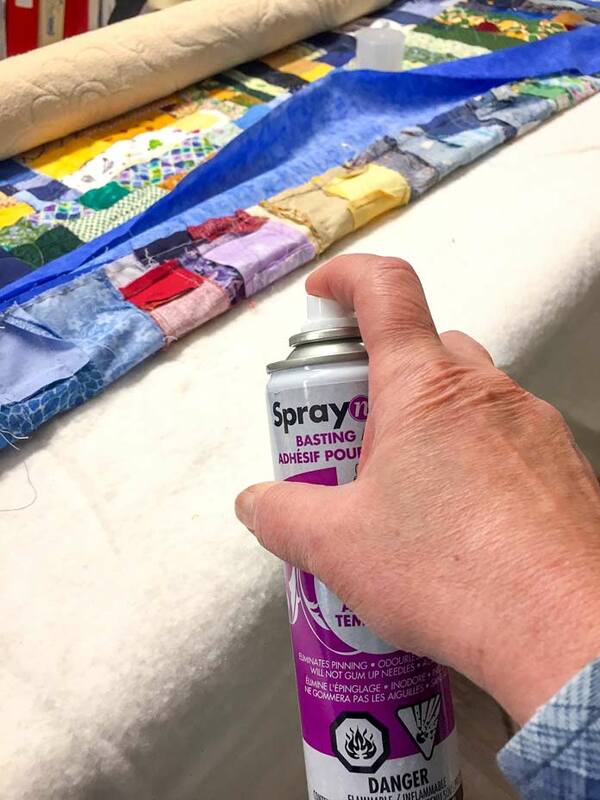 SpraynBond Basting Adhesive, spraying the layers of quilt on a long arm machine so that they do not move while the machine is in operation. Great for domestic and long arm quilters alike! 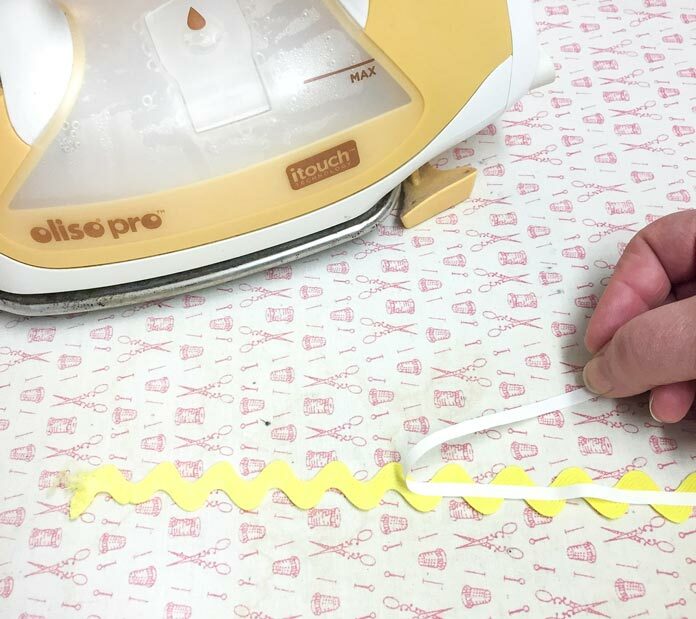 Both of these bonding methods have been rather invaluable tools in my sewing studio and make it much easier to add fixtures and embellishments to my work. Using the HeatnBond Quilter’s Edge and SpraynBond Basting Adhesive also provides an extra hand to hold items prior to sewing. If you have other uses for these basting tools, please feel free to share them with us in the comments section below. We would love to see your creativity at work, and you can post these on QUILTsocial Facebook page. Stay tuned tomorrow when I talk about: HeatnBond StitchnSew EZ Print Quilt Block Sheets, an exciting way to paper piece!